GARDAÍ HAVE CONFIRMED they’ve arrested five people in connection with last November’s Jobstown protest this morning. A spokesperson for the force confirmed that three men had been detained, along with two juvenile males. They’re being held at Tallaght, Crumlin and Rathfarnham stations under Section 4 of the Criminal Justice Act. They can be questioned for up to 24 hours. Anti Austerity Alliance councillor Brian Leech said one of his party’s activists was amongst those detained. Two gardaí called to his door shortly after 7am, he said. The man is aged in his late fifties, Leech said. He was arrested at an estate in the Belgard area. The Councillor said a 15-year-old was also arrested, at an estate in Jobstown. Just spoke to the mother of a 15 year old taken this morning. Seems it'd be better if he was in school today. 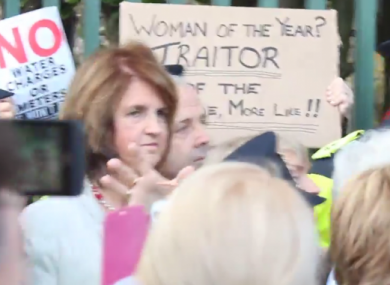 Hope you're happy Joan Burton. The Anti Austerity Alliance are planning a protest over the arrests, outside the Department of Justice at 6.30pm this evening. Email “Five arrests over Jobstown this morning --- that makes 17 this week”. Feedback on “Five arrests over Jobstown this morning --- that makes 17 this week”.